The changes mentioned last week have been finalised, and a new version of Rocklogger posted to the Android Market. This update allows you to log from any orientation, rather than using strictly the pitch of the phone. Specifically, Rocklogger calculates the steepest angle for the dip angle, and uses the direction of that angle to calculate the new dip direction/strike. This is also shown graphically by a new symbol on the logging screen (pictured). When taking a lineation, it is necessary to measure the dip of one specific axis, rather than the steepest angle. Thus, we have kept the old mode in the new version. To switch, just change plane types. By default, lineations and plunges use the old mode, now known as axial orientation. The rest use the new mode, known as Normal orientation. You can also specify which orientation you want when adding your own planes (paid only). When logging in axial orientation, the symbol doesn’t rotate, it simply indicates which direction the phone is dipping (vertical line) and the strike (arrow). Stereonet plotting is coming soon. Take a measurement from any orientation. The phone calculates the steepest angle for the dip angle, and uses the direction of that angle to calculate the new dip direction/strike. Live dip/strike symbol when logging, which points down, showing the direction of the steepest angle, and has an arrow indicating the strike. Choose whether to log in the new mode (normal orientation), or the old mode (axial orientation, which measures pitch only), by selecting the appropriate plane type. Eg you would still require the old mode when logging plunges and lineations, so select that plane type to log in axial mode. There was a small error when logging perfectly horizontally in dip & strike mode, which has now been updated in v1.31. Support has been added to devices whose default orientation is landscape (eg tablets, Droid2 Global), so that they now display and record in the correct orientation. Finally, the orientation sensor calibration has changed, and so all existing calibration data will be erased on upgrade. Fixed compatibility problems with devices whose default screen orientation is landscape (such as tablets). Rocklogger should now work correctly (rather than 90° out) in portrait orientation on these devices. Live preview – A dip/strike/plunge/lineation symbol will be shown on the logging screen, that always points down – indicating the direction of the steepest angle, the direction of the dip. These features are currently being tested by our technical consultants, and the update should be posted to the Market in the next week or so. Camera mode. Easily take photos using the camera, and have the photos saved with your .csv files. Thumbnails are shown in the edit screen, and the files are automatically attached when you email a log. IMPORTANT: Due to the wide variety of Android devices, photo capture may not work correctly for everyone. Please report any problems using the button in settings. Also note that every photo taken will also always be saved to the DCIM directory (so just remember you may have to delete these duplicates from time to time). Update: There was a performance problem when scrolling through many photos in the edit view. A new update, v1.21, has been posted that fixes this. 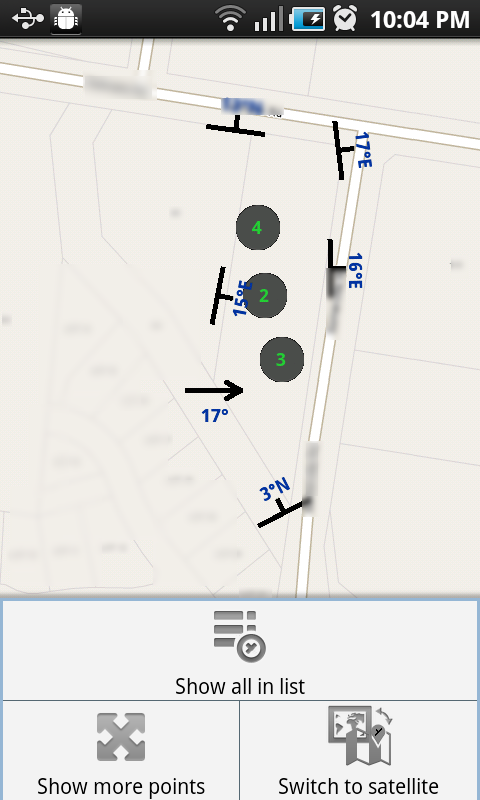 A new version of Rocklogger has been posted to the Android market. When several records are too close together, they are grouped into a disc icon, with the number of records nearby written on the icon. If you want to see what’s ‘inside’ the the icon, you can tap on it to show the nearby records in a list view, or you can tap menu-> show more points to increase the distance between records before they are grouped. I’m currently working on integrating maps into Rocklogger. I’m adding a screen that will display all records from a log file in Google Maps, using the dip/strike map symbol (aligned/rotated correctly) for each record. Tapping on each will bring up a dialog with all the info saved for that record. I have also decided to adjust the log format so that both dip & strike and dip & dip direction modes are always saved. These changes should give users more confidence in what is being recorded, as you can instantly plot it on a map, and easily check every measurement. Also, if you have any comments or feature requests, please leave a message in the comments on the Market page, or via the Contact button in Settings in the app. Thanks! Rocklogger Unlocker is now available for purchase on the Android Market. Run it to unlock Rocklogger and remove the evaluation version’s limitations (evaluation version can only save 3 records per 3 minutes, and magnetic logging is limited). Internet access is required to run the unlocker. Rocklogger will be temporarily unlocked whilst in the Android Market’s refund period (15 min). At the end of this period, run it again (with internet) to permanently unlock Rocklogger. You can then uninstall the unlocker if you wish. Thanks for supporting Australian geology software development! 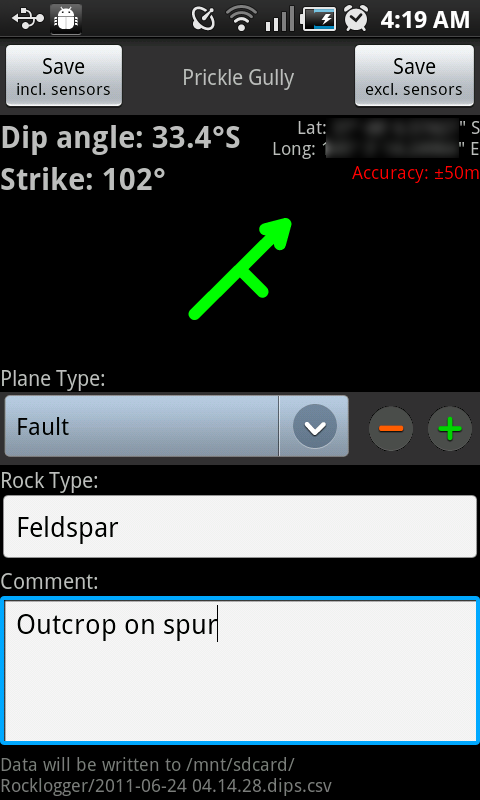 Rocklogger is a rock logging app for geologists with an Android phone. It uses the phone’s orientation, compass and GPS sensors to measure either dip & strike, or dip & dip direction of rock outcrops. It can also save the ambient magnetic field. Taking the dip and strike of outcrops with a compass/declinometer usually takes a few minutes per rock. With Rocklogger, many measurements of an outcrop can be taken in seconds. Rocklogger is now available in the Android market. See the Download page for details.